It's been a while since I read George Orwell. I've read the two famous works of his, Animal Farm and 1984, in case of the latter, I have read it twice. In both books, Orwell shows his critique of totalitarianism. Animal Farm was clearly anti-Stalinist, and 1984 also was painting a dystopian society. 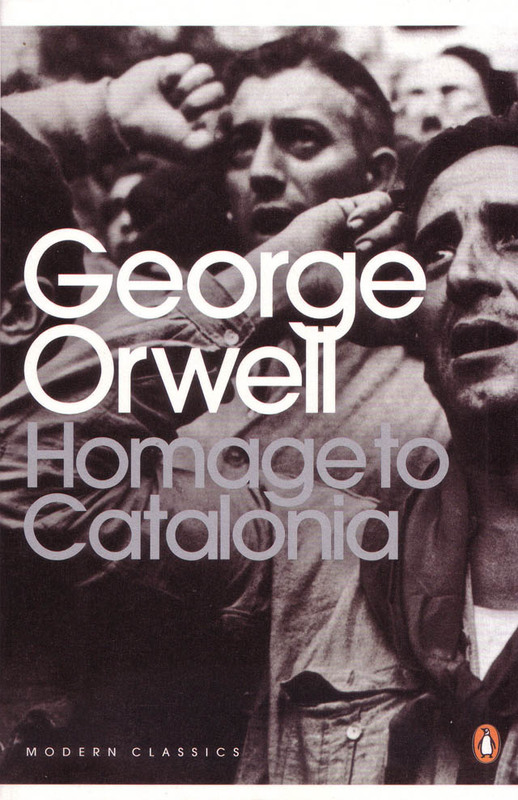 Orwell clearly was against Fascism and totalitarianism, and this memoir of his time in Catalonia during the Spanish Civil War also reflects this. That being said, there is a part of me that thinks that he was quite naive and idealistic, that I found hard to relate to. See, this book tells his experiences during the Spanish Civil War. Orwell was English, yet because of his idealism, he sent out to Spain to fight for a foreign militia, so that he can fight against the Fascists. He was there in Spain, partaking in a battle that was not his, for 6 months. After that, he gets injured on the neck, even though for the most part he didn't get to see action. And later on, because the militia he was a part of was declared illegal, he had to escape the country and go to France. That's about it for the plot. Not that I wanted more from it. This is not fiction, after all, and Orwell cannot really control the plot, so to speak. There are two things I want to comment about, however. One has something to do with Orwell's idealism, and another has something to do with Orwell's traditionalism. Orwell wants to champion democratic socialism. Basically, he aspires for a classless society, a society that has no division between rich and poor. Basically, he wants the Communist ideal, without the negative aspects of Communism. So somewhere in there he also values democratic principles and individualism. However, I feel like he is trying to have his cake and it eat too. Orwell loved it when people didn't do things because of class differences: he loved it when people stopped calling each other Senor and Senora and instead called each other Comrades instead. However at the same time he didn't like the totalitarian aspect of most Communist parties. The thing is, what he is forgetting is that people have the tendency to want to be better than others. As much as I think a classless society is great, I also think that this is too utopian, and cannot be implemented. After all, we are not equal in our abilities. Man would want to dominate the other (just look how politics work), and so it is unavoidable to have classes in a society. Instead of being idealistic, I feel like I would rather be pragmatic and be realistic, working with humankind's strengths and flaws. A defective society that actually functions is better than a utopian society that is unimplementable. I also found it slightly annoying that Orwell was a person who was steeped in tradition. He wanted an ideal classless society, he wanted change. He wanted it so much that he went to a foreign country to defend these principles. Yet implicitly, he still thinks he is better than others. He thinks that Spaniards are inherently inferior than the English. Spaniards cannot shoot guns properly. Spaniards cannot stick to schedules. Spaniards have a lot of weaknesses, according to Orwell, who prefers the predictability of the English society. It might not be a difference in class but a difference in cultures, but isn't that more or less the same thing? To be honest, the thing that I really disliked in this book was the Imperialism that was reeking out of its pages every now and then. It would have been nice if Orwell saw much more cultures than what he has. Maybe he'll be more open-minded and acknowledge the strengths and weaknesses of other cultures, as opposed to always evaluating other cultures (and classes for that matter) against his own. Britain is a great culture, but it is not the greatest. That being said, I don't think this is a disappointing book. I simply didn't agree with the author's politics that much. Historically, this book is of great value, and is definitely a must-read to anyone who is interested in this period of history. I give this book 3 out of 5 stars. See my other book reviews here.